If you're like a lot of anglers that I have met over the course of my fly fishing career you more or less stumbled into the sport of fly fishing, and if you had some experience fishing with bait or lures you have the benefit of some knowledge about fish and the basics of angling. However, if you are like many recent converts to the sport you are completely in the dark about even the rudiments of the game. There are no shortage of books, magazine articles, schools, and seminars that offer to teach you what you need to know, but where do you start, and what is important and what is merely fluff? At risk of adding to the cacophony of conflicting advice I would like to offer the following ideas for your consideration. Since the advice is free and unsolicited you may take it or leave it. The acronym KISS quickly comes to mind. If you don't know what that stands for perhaps it's just as well, but basically the idea is simple is better. Most anglers, myself included, have far too much stuff, and the more stuff you have the more complicated everything becomes. A proliferation of stuff is often the outgrowth of a belief that the person with the most toys wins! Some of the worst fly fishers that I have ever witnessed had the most stuff, and some of the best were the guys with the patched waders, a couple boxes of flies, and equipment that went out of style during the Great Depression. What they lacked in equipment they more than compensated for with the application of skill and knowledge. Boxes full of flies may give you more choices, but the more choices you have the more likely you are to spend most of your time changing flies hoping to find the right pattern. 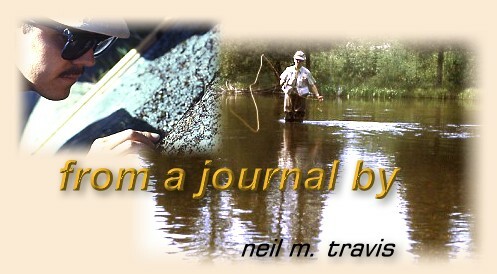 The angler that understands where they are fishing, what types of naturals are likely to be present, and what patterns best imitates those naturals may only have a few flies in their box but lots of fish on their offerings. While on the subject of flies, especially trout flies, my old friend Vince Marinaro was a proponent of simple patterns. "I am continually astonished," he wrote, "by the fact that the most killing flies in fly-fishing history are of very simple construction." You can read many articles about how to tie flies that look like they will get up and fly away once they are released from the vice, or patterns that require more kinds of material to tie than are needed to make the Space Shuttle. Every year there is a plethora of new patterns that appear in the latest fly-fishing catalogue or in the bins of your local fly shop, but most of those patterns will be replaced by 'new and improved' versions the next year. It would pay you to notice the patterns that are listed every year, and to keep a ready supply of those in your fly box. Fill in the rest of the slots with some of the newer stuff, but I think at the end of the season the flies that will need to be replaced because they have been chewed up by fish are the simple patterns that have stood the test of time. What can be said about flies can be echoed when talking about equipment. Despite protests to the contrary the average trout fisher does not need a fly reel with a complex drag system to fight and land a trout. Basically the reel is a storage spool for the fly line, and the fewer bells and whistles it has the more likely it will be to perform that task without difficulty. I still have an old Pflueger fly reel that is basically a spool contained in a frame. It has a simple drag system controlled by a small knob on the frame, is easily convertible to right or left hand wind, and is virtually indestructible. I am quite confident that I could, and I have, use it to fish for trout on any trout stream, control the line, and do it as well as ny modern marvel that costs 100 times as much.